I received this arc from the publisher for an honest review. Pierre L'Errant is a vampire and was an Anishinabe man, he has come home, back to the Otter Lake Reserve after an absence of some 300 years. 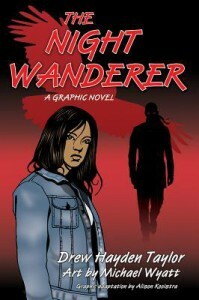 Tiffany Hunter is an Ojibway teen, and has spent her entire sixteen years of life living in the Otter Lake Reserve. It is inevitable that their paths will cross, not least because Pierre has chosen to lodge with the Hunter family for the duration of his stay. The native American Hunter family has experienced a relatively recent upheaval with Tiffany's mother having abandoned the family the year before, leaving her living with her father and grandmother. Tiffany's mother left the reservation with a white boyfriend and Tiffany's new boyfriend Tony is white and whilst he does not come out and say it plainly, we are led to assume that this is behind her father's antipathy towards Tony, result more grief for Tiffany. Tiffany is a native American and lives on a reservation, but aside from that I did not see what made her so particularly extra-special. She appears to be a typical teenager, going through a typical teenage phase. Pierre does a of of moping and lurking about, visits a few old haunts, terrifies the locals and tells a tale or two. Pierre was a bored teenager and longed to go and explore the wider world, and off he went, Tiffany is a bored, angry teenager and naturally assumes the grass is greener elsewhere. This is a novel in which the graphics are either black, white or red, chosen to enhance rather than detract from the story, however, whilst I have no complaints about the technique used internally, I found the cover art a little basic. It did not immediately appeal to me as a book I would want to read. I felt that the use of flashback was extremely effective to tell Pierre's story of how he came to leave the village, this aspect of the story was engaging but much too short. The original novel is apparently 215 pages long, so it is plainly obvious that a great deal of information was not transferred over to this graphic novel. I do not know how the original play or the novel addresses the character of an adult Pierre, but aside from an incident on a baseball field, I thought much more could have been added. Apart from being moody, old and liking blood who was Pierre? Apart from being moody, angry and ditching her friends for her boyfriend who was Tiffany? Engaging, but empty and over too soon.